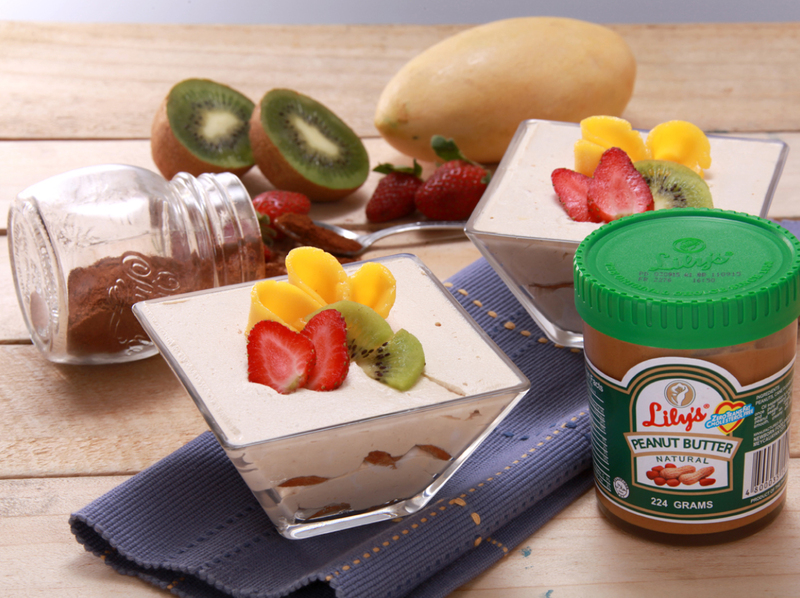 Cheesecake is the main film of this sweet dish consisting of one or more layers, sweetened and flavored with the best peanut butter ever, Lily’s Peanut Butter! Topped with milk chocolate cup confection made of chocolate-coated peanut butter and a spoon of chocolate goodness that delivers you to perfect heavens you would never resist. Made healthier because it is a good source of vitamin A, followed by selenium, riboflavin, phosphorous and calcium, plus the laxative properties and high levels of soluble fiber of dates which helps promoting healthy bowel movements and the comfortable passage of food through the intestinal tract, which can relieve symptoms of constipation. Place bowl of an electric mixer (or a large glass bowl if using a hand-held mixer) in the freezer to chill for at least 15 minutes. Meanwhile add dates to the bowl of a food processor then process until well chopped. Add chocolate sandwich cookies then process until mixture is completely smooth. Scoop 2 Tablespoons of the mixture into each cup then use a spare cup to press down and form a crust. Set cups aside. Fit electric mixer with the whipping attachment then add heavy whipping cream to the chilled bowl. Start whipping on low speed then add vanilla and gradually add powdered sugar. Turn speed up as cream begins to thicken then whip until mixture is thick and smooth (don't over-beat or mixture can start to turn into butter,) 2-3 minutes. Scoop 3 cups whip cream into a bowl (may have a bit extra) then refrigerate. Fit electric mixer with paddle attachment then add peanut butter, cream cheese and sugar to the mixing bowl, and then mix until smooth. Add reserved whipped cream then mix just until combined. Scoop mixture into pastry bag then snip the corner off and pipe 3/4 of the way up the cup. Tap on the counter to make sure tops are even. Heat hot fudge sauce according to jar instructions then scoop 1 Tablespoon sauce on top of each cup, tapping gently to help spread evenly. Cover with plastic wrap then refrigerate for at least 10 minutes ahead of time. Top with chopped Reese's Peanut Butter Cups, if desired, then serve.